Today I've got a guest post and movie review from Catherine. Can't wait to see this one! If you loved How to Train your Dragon (2010), you’ll be glad to know that the sequel to the blockbuster Vikings-and-dragons saga is here. Now you can once again accompany Hiccup and Toothless as they take off on another round of airborne adventures, this time into faraway unexplored lands peopled by villains and vigilantes and captive dragons in secret caves. The first installment narrated the trials and exploits of a scrawny unpopular kid who must win the respect of his clan by killing a dragon, and how he manages to turn the tables by brokering peace between the warring species. 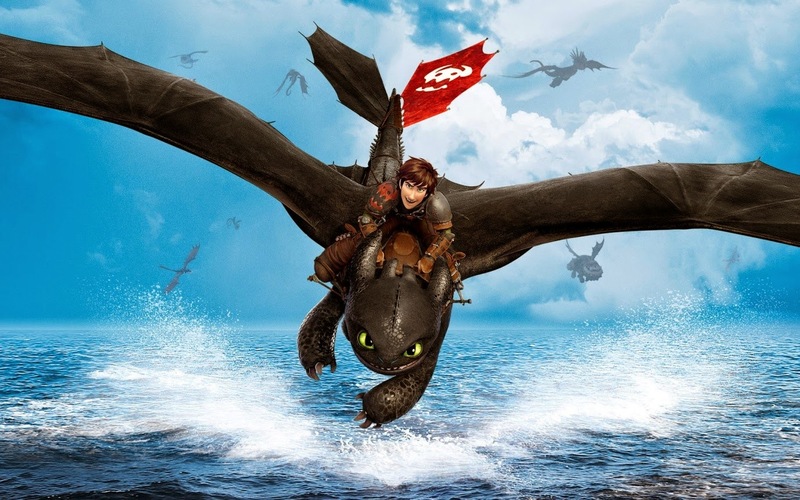 Here’s a quick How to Train your Dragon 2 review for those of you who need to be in the know. The second chapter of the planned trilogy starts five years from where the first one ends. Hiccup Horrendous Haddock III, son and heir of the Viking chief, has achieved everything he set out do – he has won the respect and admiration of his clan, the love of his father and has even managed to win over Astrid, the spunky girl Viking he was pining for. Hiccup has indeed come of age. Now bosom buddies Hiccup and Toothless must brave new challenges and explore new worlds where they will meet the crazed vigilante Valka who prefers dragons to humans; arch-villain Drago Bludvist who wants to conquer the world; the slow-witted Eret, dragon trapper and henchman to Drago; and many other fascinating characters, old and new. There are plenty of surprises in store for the intrepid duo as they try and save the Viking world from the machinations of Drago. This evil being has vast resources of money and power at his disposal. He dreams of building an army of fearsome dragons to make people believe only he can keep them safe and thus gain control over the world. He is thwarted in his designs by an army of dragon riders, headed by Valka. (The dragon lady eventually turns out to be none other than Hiccup’s long lost mother, but that’s another story.) The dragon riders seek to remove the fear of dragons among humans and establish cross-species harmony. Can the dragons and the Vikings put aside their differences to stop Drago? Or will peace be the casualty of one man’s ambition? Watch the movie to know! An exhilarating, epic journey that mixes both comical and touching moments with some of the best animated 3D action sequences ever created certainly makes How To Train Your Dragon 2 one of the biggest releases of this year.